Today’s contact center environment is very complex, with multiple applications and systems supporting global operations, so the need to maintain a single, accurate view of the business is more critical than ever. Behind the masses of data we gather on a daily basis on behalf of our Clients, lays our sophisticated Data Warehouse (DWH), which uses the latest database technologies to bring in and manipulate consistent, validated data from multiple sources. These include CRM systems (MS Dynamics, SAP and Siebel), Phone ACD Switches (Avaya CMS and Cisco IPCC), Customer Satisfaction Surveys (IVR After Call and Email CSAT Surveys), Quality Assurance Evaluations, Social Media Portals and Workforce Management (eWFM). The Warehouse sits independently from each system it supports, reducing degradation of each individual source. Across our global operations, the DWH provides us with consistent, accurate and actionable data for our Clients, which can be sliced, diced and distributed quickly and effectively. For us, the true value our Clients gain from this system is the sheer number of metrics we have the ability to analyze and report on. These include Operational Service Levels (for example, Average Handle Time), Customer Satisfaction (CSAT) and QA Evaluation scores, all captured down to agent level. Access is granted to agents, Team Leaders and Management, which means the data can be used to assess performance on an individual basis and can be fed back in to training for long term development. 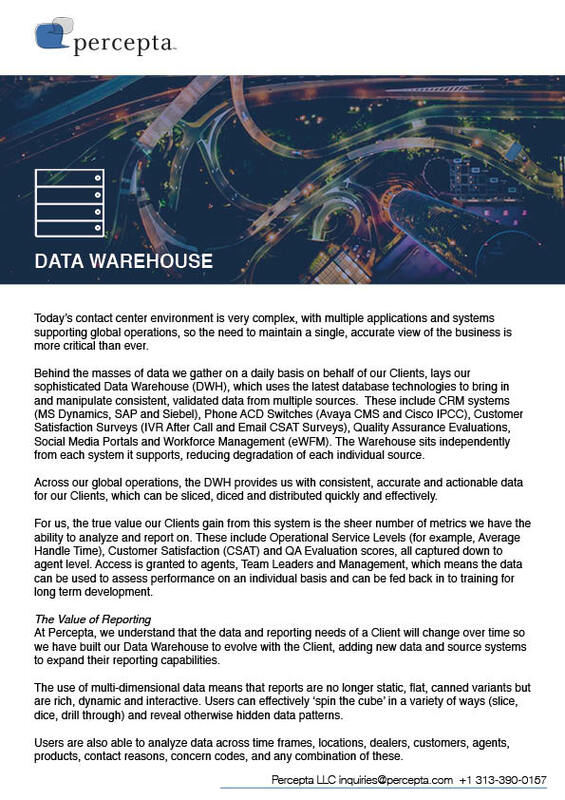 At Percepta, we understand that the data and reporting needs of a Client will change over time so we have built our Data Warehouse to evolve with the Client, adding new data and source systems to expand their reporting capabilities. The use of multi-dimensional data means that reports are no longer static, flat, canned variants but are rich, dynamic and interactive. Users can effectively ‘spin the cube’ in a variety of ways (slice, dice, drill through) and reveal otherwise hidden data patterns. Users are also able to analyze data across time frames, locations, dealers, customers, agents, products, contact reasons, concern codes, and any combination of these. We firmly believe that anything the agent captures on the screen should be reportable and we strive to achieve this through our DWH technology. We also make sure that having all of this power at your fingertips is as simple and undaunting as it can be. But our Warehouse is not just for performance reporting. 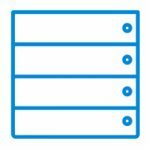 We have had experience in using the system for data quality services, identifying issues with data held in source systems (duplicate records, inaccurate/invalid data) and also helping Clients out with data migration projects. Within the Data Warehouse, our Percepta-designed Analytics Application is a real value-add to our Clients’ business. It links CRM cases recorded by the agents, to call metrics, CSAT surveys, and QA results to help solve complicated operational issues. For example, after searching by CSAT Survey results and selecting the team and agents, a team leader can view the QA voice and screen recording by simply clicking on the recording link in the analytics tool. In addition to reviewing the QA recording, all the other data associated with the recording is available; including a link to review the case, the detailed call metrics, as well as details of the agent that handled the call and the team leader they report to. The ability to drill down to this level of detail has a huge influence on our ability to coach and refine our performance in each operation. The tool greatly improves each team leader’s productivity in reviewing agent interactions and the ability to provide immediate feedback to agents. This immediate feedback can then be used for on the spot training and long term development of each individual in the Center.